To collect Space Prints you will need the Backyard Observatory (aka: Telescope). There are three options available from the observatory: “Observe the Sky”, “Stargaze” and “Search For the Truth”. These interactions will help you unlock all space prints. The rare prints can only be acquired by using the “Search For The Truth” interaction, which requires a level 7 in the Logic Skill and the “Focused” emotion. 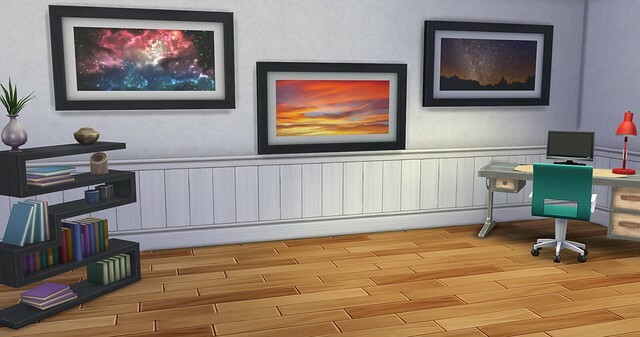 Sims using the observatory will get kicked into the focused emotion just from using it, so it won’t be hard to accomplish that. Enable Emotional Aura: Certain Space Prints will give off the “Focused” Aura if you choose to enable it. This automatically guarantees the specified emotional state of all Sims who are near the prints. Surfacing Rare §475 Just imagine this strange world as it would look viewed by an alien returning to its home planet. Oh the longing in that alien's five heart chambers, the tears in its 22 eyes. Back on the surface, it will no longer be "alien." It will visit its neighborhood bar, where everyone knows its name: "XF2&23%tY." Star Crossed Lovers Uncommon §210 This fantasy painting captures the mythical union of a crystal rock formation with a sizzling comet. Theirs was a love affair that defied gravity, physics and, well, probably several other laws. No one thought it would last. In fact, it didn't. But at least it burned out, before it faded away. Cloudy Vision Uncommon §265 In space, cloudy days trump sunny ones. That's because the clouds are made of green glitter! The sun, on the other hand, is made of fire and radiation. Before visiting space, definitely check the space-weather forecast. Or Just stay home and marvel at this painting. Twinkle Uncommon §285 Is it a rainbow? A cloud? Stars? You might want to sit down, because it's actually a rainbow-colored cloud filled with stars! If you do not enjoy the unbelievable union of magic things in this painting, well then, sorry there's a cold hunk of obsidian where your heart should be. Saturn Return Uncommon §290 Hubba hubba! Check out this glamour shot portrait Saturn had done a few years back, when it went through a divorce and lost all that weight (who's the second largest planet NOW. Uranus?). The slight blue glow really brings out its rings. Rumor has it that it's dating again and has recently attracted a sixty-third moon. I Dream of Plesiosaur Uncommon §215 A cloud formation looks deceptively like a wandering plesiosaurus, set against a stunning early-evening vista. What might the cloud plesiosaur be searching for? The gentle stratus doesn't answer, but floats on, unaware of its inevitable demise. Standard Space Common §130 Yup. Here's some space. Looking space-like. It's got the stars. And the dark, gassy looking stuff. And some more stars. Hang it on a wall, to give that wall a real spacey feel. End of Time Common §135 Oh, no! Someone just flushed the universe. Jiggle the handle! Jiggle the HANDLE! Animal's Planet Common §115 In the X57 region of the 1245P-Brock galaxy, there is a planet populated entirely by giant hamsters. Here, two monster-sized hamster balls glisten in the sun, awaiting the return of their fuzzy inhabitants, who are busy running on a Ferris wheel (not pictured). Rosie the Riveting Common §125 Gasses such as helium and hydrogen pool together with interstellar dust to create this riveting, rose-colored nebula. Why ARE gasses and dust so attractive way out there in space? Here on earth, this helium balloon covered in dirt - well, it's just not the same. Seeing Red Common §110 Mars is the red planet. The dirt is red. The air is red. Want to wear blue pants on Mars? Too bad! There are only RED pants on Mars. This painting shows the Mars sky, with its fiery red clouds. Beautiful to an Earthling. Martians, however, have coined the saying, "Let's go out and paint the town green!" Out of This World Style Common §105 Like cars, rockets come in different models. The sleek sports rocket. The SUV soccer mom rocket. And this - a reproduction of an ad for the tricked out luxury sedan rocket. Its style is inversely proportional to its aerodynamic qualities. Get to the moon slower. And look good doing it! Big Star Common §140 The comet is the prima donna of space. Look at it, trailing its beauty across the sky, taking up 75 percent of this entire painting. In fact, the artist was trying to capture a blank, night sky, and the comet totally photobombed that scene. What a diva! 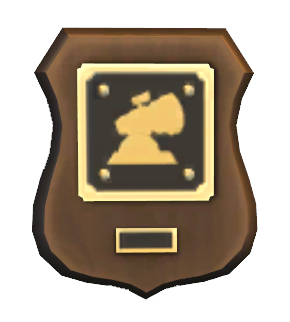 The Gargantuan Telescope Plaque §0 Awarded to household when completing the "Space Prints" Collection.